This site contains all of the information you will need to become a knowledgeable participant in the First District Northern ATON and Chart Updating Programs. All the necessary forms, procedures, training programs, check-off lists, and links are available on this site for the four NS Programs (ATON, PATON, Bridge and Chart Updating). Choose a program that you feel you may want to participate by just clicking on the links to the left. If a AV is not acting as BC for that U/W mission than he/she is just a passenger/guest and only requires a type III… The AV (member) mission hrs are not counted in AOM for that member... 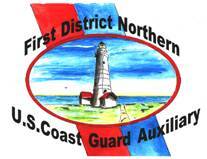 The AV must have their hrs entered into AUXDATA by the member’s FSO-IS. They are not to be listed as “trainee” in AOM. They, unfortunately, are not going to get reimbursed for anything like the BC members are entitled to during that facility’s patrol. The AV is covered for liability/medical during that mission/patrol because he/she is doing an authorized Aux activity. Note: Many files on the D1N-NS site are in Adobe format. If you need the free reader click on the image above.